I have for the longest time been a fan of passive speakers and leery of actively powered ones. When setting up what became the first of the Whisper reviews I diverged from Legacy’s typical build incorporating ICEpower amplification for the bass and requested that it have no internal amplification. I know how fundamentally an amplifier influences a speaker’s sound. I wanted full control of contouring even the bass performance. At the time, having used ICEpower-based amps, I was not ready to concede to that as the amplification for the Whisper. When the V review was confirmed – I waited a year for the pair to come to me as Legacy is running to catch up with orders – I didn’t have the guts to ask for customization such as was done with the Whisper. I thought, “If it’s that good, it will be superior in stock form.” My biggest fear in accepting the stock V was that the bass and LF would be less than ideal. I had not the least bit of worry over the midrange performance on up the frequency spectrum. Having worked with several Legacy speakers I knew it would be splendid. I wondered if the internal ICEpower amps would provide crisp and yet supple enough bass. I was concerned that the V might not have the presence that the twin Legacy XTREME XD Subwoofers and Whisper have. In reviewing I have used an array of midrange drivers, including a generously sized Accuton 6.5” ceramic, generous electrostatic line source drivers in the Kingsound King III, and the quad 7” midrange drivers of the Whisper. Yet when I turn my ear to the V, the midrange is so exuberant, so wafting, so relaxed and corpulent that my mind goes, “Ahhhhhh,” as though I am slipping into a sonic hot tub where nothing but easeful comfort is going to occur. So much is made of the midrange of older Quad electrostatic speakers, but you have not heard luxurious midrange with utter ease until you have heard the 14” mid-bass drivers as they partner with the dual 6” curvilinear upper-midrange of the V.
There are so many streams of sound quality that rush together in these hybrid speakers with oversized midrange drivers. At times they remind me of electrostatic speakers, while at other times I could be convinced I’m listening to a fine vintage horn speaker. The huge 14” drivers are 22dB more efficient than the neo-ribbon tweeters, so they sound completely effortless, far more effortless than the 6.5” ceramic Accuton driver of the Vapor Audio Joule White 3. These huge mids are so forgiving on the ears that you can listen at quite high levels and feel no strain at all in the music. Due to the extraordinary design and phenomenal flexibility of setup one can be assured that listening fatigue can be completely eradicated. Legacy has found a key to fantastic listening experiences by emphasizing total driver surface area, especially in the midrange. You can pay any amount of money you wish for a speaker with smallish midrange drivers and not get this experience. I am enthusiastically in agreement with Bill that there is simply no replacing the benefit conferred by drivers with larger cones. There is ease and grandeur that escapes smaller scaled speakers. In the case of the bass, the V is actually more formidable than the collection of 15” drivers in the Legacy subwoofers and Whisper. Bill confirms this by pointing out there is far less destructive wave interference with the V.
It takes an artisan’s touch to bring such a collection of disparate drivers together and harmonize them not only so that their distinct properties are correlated, but also so that they operate seamlessly. Bill is a rare artist in the acoustic realm, displaying deft ability to capture the strongest positive contributing properties of the drivers and joining them with the appropriate crossover for each. In the case of the V, the advantage especially of the enormous 14” curvilinear mid-bass drivers fairly ruins appreciation of other floor standing speakers regardless of the caliber of their comparatively smallish drivers. Specifications matter – a lot. When I first started building systems I was tempted to underweight specifications by discounting differences in them between speakers. Over the years I learned to scrutinize specifications to get a feel for the performance boundaries of speakers. It is possible to build a general performance profile for a speaker from relatively few measurements. For instance, three of the V’s most telling specifications, Nominal Impedance, Sensitivity and Frequency Response, are noted on Legacy’s website. The impedance of the V is 4 ohms for its upper range. The bass and subwoofer are internally powered by threel 500 Watt amps, an amp each on the subwoofer’s dual voice coils and another on the upper woofer, making their impedance when system building a moot point. Sensitivity of the V is listed as 98dB according to standard measurement and the frequency response is listed as 16Hz – 30kHz +/-2dB. That may not mean much to you, but I will explain why it should. These are not merely exemplary specifications; they are extraordinary, and it means the V is inherently capable of world-class performance. Remember the discussion about explosive, volcanic performance? These numbers indicate the V has the potential for it. I don’t even have to hear such a speaker to know that in several respects it is special. Why is that? 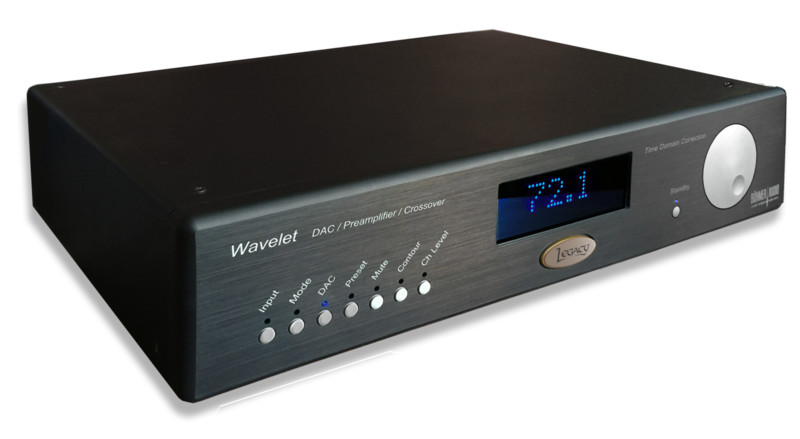 Normally the lower impedance at 4 ohms would mean the V would require four user-supplied channels of amplification with generous current delivery, but since the bass and subwoofer already have their own internal amplification a high current amp design is not necessary. The sensitivity is outstanding and means that the sense of snappiness and impact the V has per watt is quite high. The amp’s power will be converted more to acoustic energy – impact – rather than chewed up by the drivers as is the case with a lower sensitivity speaker. Sensitivity indirectly tells how much “get up and go” the speaker has, how much crushing power, and the ability to make music sound forceful or graceful in terms of dynamics. The frequency response tells especially how deeply a speaker plays precisely, which is crucial to the sense of fullness and weight to the foundation of the music. The size of the V comes into play here, as it is both easy to drive and huge. The scale of the speaker allows for a very generous frequency response range that is critical to achievement of a sense of majesty. Two things are important in regard to frequency response: the lower limits and its character. Larger drivers have different capacity and sound different than small ones regardless of brand and build of the cabinet. The size of the drivers places hard limits on the depth of the low-end response and generally correlates to the sense of ease they exhibit. These variables become increasingly evident as a speaker is driven harder. Imagine that these three specifications could be applied to aircraft, with impedance being synonymous withl lift, sensitivity equivalent to thrust, and frequency response equivalent to maneuverability. The impedance specification is a measure of the nominal electrical resistance a speaker presents to an amp. The lower the impedance the more current is needed from the amp, just as generally the smaller the aircraft wing the more thrust is needed to get the plane airborne. Sensitivity in speakers is like thrust, the amount of power to overcome the weight of the plane. Assuming two planes with similar build but differing weight, lower sensitivity is like a heavier plane that requires more thrust, and higher sensitivity is like a lighter plane requiring less thrust. Putting these two together, ideally you would want a plane that has maximum lift and thrust. Similarly, you would want a speaker that has higher impedance and sensitivity. A plane that had maximum lift and thrust would require almost no energy to become airborne and the more power supplied the better it would perform. A speaker with maximum impedance and sensitivity would require almost no power to play and the more power supplied the better it would play. Frequency response is like maneuverability in that the wider the range and the more precisely it can be done the more acrobatic the speaker will seem. In the real world, trade offs must be made, which is why it is at this point in time technologically impossible for all three specifications to be maximized in one design. Let’s look at a couple of examples. First a speaker having higher impedance, relatively lower sensitivity and more limited frequency response. The specifications might be 8 ohms, 88dB and 35Hz to 25kHz +/-3dB; this would make it like a commercial passenger jet. Conversely, a speaker with relatively lower impedance, higher sensitivity and wider frequency response would be like a jet fighter; perhaps specified as 4 ohms, 98dB and 20Hz-40kHz +/- 3dB. Putting the illustrative numbers together, the first speaker imagined as a commercial cargo plane would operate in a more restricted fashion than a fighter jet, and would not be nearly as acrobatic. The second speaker, the fighter jet, would carry a higher sense of instantaneous power, would go relatively higher and much lower and seem more “acrobatic.” These are imperfect examples, but they serve to give you an idea that the specifications dictate performance. These things can be known simply through familiarity with the specifications, no demos needed. While these numbers do not tell the entire story, for instance how clear or tonally pleasing the speaker is, they tell much of the story. It pays for the audiophile to learn what the specifications mean in terms of performance.